Separate the whites from the yolks. Grind walnuts. Beat egg whites with the sugar and 1 tbsp of lemon juice until stable peaks. Lightly fold in meringue nuts. Can shoot a form of the parchment. Spread mixture into the pan and bake for 20 minutes at a temperature of 150 g and to dry at a temperature of 110 g in about an hour. To prepare the dough. To pound yolks with sugar, add sour cream, soda, slaked lemon juice, vanilla sugar and sifted flour. The dough is obtained as pancakes. Bake one cake (then cut it in half) at a temperature of 190 g about 1 hour. Readiness check wooden skewer. To prepare the cream. To do this, beat 150 gr. butter, tin of condensed milk and 3 tbsp cocoa. For the top whisk of 0.5 tins of condensed milk and 50 g oil. Put the cake together. Coat the cake with cream, then meringue with nuts, again cream. 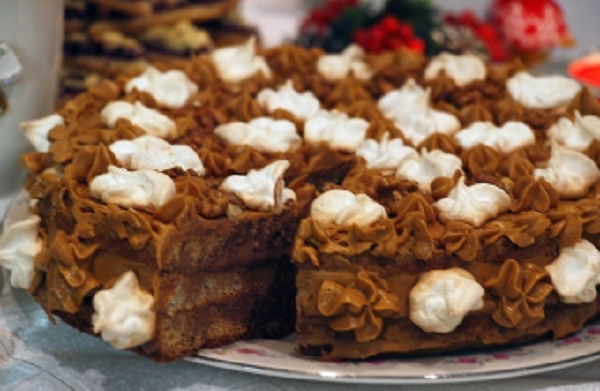 Decorate with nuts and meringue. The cake must stand in the cold for 10-12 hours and will get the desired delicate flavor.